Perhaps no sound more clearly evokes an image of wildness than the honking of migrating geese. It is hard for us to believe that some 80 years ago, the Canada goose was thought to be nearly extinct! Canada geese are large birds, averaging 10-14 pounds. 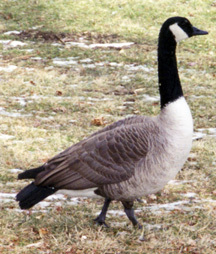 Among waterfowl (ducks, geese and swans) of North America, Canada geese are second only to swans in size. Geese form permanent pair bonds, but if one bird dies, the other will seek a mate in the next breeding season. Most Canada geese don’t begin nesting until they are three, but make up for it by being long lived. Adult females lay 4-6 eggs in a clutch. If the clutch is destroyed, geese generally don’t re-nest, but with two large birds guarding a nest, the chances of success are good. Usually by the time the young are 4-6 weeks old, the broods begin gathering into one large flock. Non-breeders and yearlings form separate flocks. By fall, they all gather into one large flock. Canada geese have passed through Colorado on their journeys to and from their Arctic breeding grounds for centuries. But it was unusual for them to spend much time here. 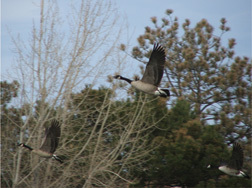 Yet today in Colorado you can find Canada Geese any time of the year. In some areas there are too many geese! Why the change? The comeback from near-extinction of the giant Canada goose (Branta canadensis maxima), is one of the great wildlife success stories of the 20th century. That it went terribly awry late in the century is an irony pioneering conservationists couldn’t have thought of, anymore than they could have thought of suburbs. Robins were routinely killed and eaten back then. People collected and ate songbird eggs, too. A huge market for wild-bird feathers, sold to hat makers, thrived world-wide. At the London Millinery Feather Market’s quarterly sale in August of 1912, the feathered skins of 1,600 hummingbirds, bound for bonnets, sold for two cents each. Just as the great herds of American bison were killed for commercial gain, all wildlife was the booty of professional hunters who killed year-round without limits on what they could sell. Butcher shops were full of birds and animals shot or netted by hunters. Wild birds were killed out. The Labrador duck became extinct in the 1870s and the passenger pigeon, netted and sold as squab, soon would be too. (The last one died in the Cincinnati zoo in 1914). Stopping this carnage was the first triumph of the American conservation movement. It took decades. In 1878, Iowa adopted the first bag-limit law, restricting shooters to 25 prairie chickens per day. In 1900, the first Federal conservation law, the Lacey Act, prohibited interstate commerce in illegally-killed game. In 1901, Oregon limited hunters to 100 ducks per week. Enforcement, however, was rare. In 1916, the U.S. and Great Britain (on behalf of Canada) signed the Migratory Bird Treaty, to regulate commerce in wild birds. Legislation implementing it passed two years later. But by the 1920s, some six million recreational hunters had become as much of a threat to wild fowl as professional hunters were before. In 1930, the giant Canada goose, which had been relatively easy to hunt, was widely believed extinct in the wild. Bringing the Canada Geese back became an urgent quest. Something crucial happened in 1935: Live decoys were outlawed. These were wounded or caught birds, used by hunters to lure wild birds into gunning range. Decoys were held captive by cutting a wingtip or clipping feathers so they couldn’t fly. 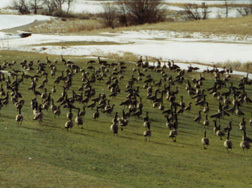 Decoy flocks held some of the last giant Canada geese in existence. When live decoys were outlawed, hunters got rid of tens of thousands of the birds. Wildlife agencies took some, to help restock wild populations. But many settled in local communities. Some towns wanted the geese for park ornaments, like peacocks. Farmers took and raised others. The geese embraced human habitats and handouts. When America’s suburbs sprouted after World War II, “resident” geese soon moved in. With plenty of food and protection from predators and hunters, they thrived. An important aspect of the migratory Canada goose was not understood! A Canada goose is driven by instinct to nest near where she hatched. So birds hatching in the states had no interest in migrating. They became permanent residents. These birds do not know or care where their ancestral nesting grounds were! Resident Canada Geese have adjusted well to living near people, with few significant curbs on their numbers. 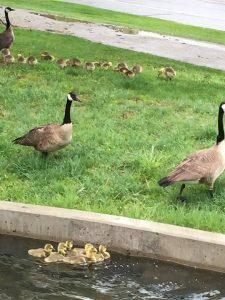 Resident geese in cities and suburbs are safe from most predators, many people like to feed them, and they are less vulnerable to hunting because they tend to live in settled areas where firearm restrictions often apply. By contrast, migratory Canada Goose populations are held in check by migration mortality, predation, late winter storms, and hunting. Resident geese begin nesting at a younger age and produce larger clutches than migratory geese. It’s no wonder their numbers are rising so fast. From then until the 1980s, federal agents rounded up “nuisance geese” in the suburbs, and relocated them to other states, where they were wanted for hunting. Some stayed, and nested, some simply flew back to their original nesting area in the suburbs. In 1982, an avian influenza outbreak brought relocations to a halt. 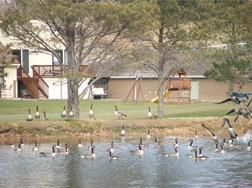 Goose populations soared. By the time relocations were allowed again, Colorado was able to relocate geese within Colorado up to a few years ago, but now, no one wants more. Nonmigrating geese are multiplying fastest on the East Coast, says the Fish and Wildlife Service, at an average rate of 14% a year since 1989. Nonmigrating geese now outnumber wild, migrating geese along the Atlantic Flyway, the agency says. Colorado lies in the Central Flyway. The Central Flyway is an administrative unit for migratory game bird management. It is comprised of ten states (MT, WY, CO, NM, TX, OK, KS, NE, SD & ND), two Canadian Provinces (Saskatchewan & Alberta), the Northwest Territories and Nunavut. In the decade of the 1960’s, winter counts of all Canada geese in the Central Flyway (CF) averaged about 220,000. The average winter count between 1995 – 2005 was about 1.5 million, an increase of nearly 600 percent. The percent of the total population of Canada geese in the CF from the Great Plains Population, which is the name given by the CF to restoration birds, changed from about 5% to about 20% during a time when all Canada goose populations were increasing. In 1970, there were twice as many migratory geese as resident geese. Now resident geese outnumber the migratory geese by about 26%.